At the very bottom of the eBay home page is an easy-to-miss tab entitled Legal & More. Clicking the tab takes you to an unassuming group of links that provide more ways to get to some seriously handy pages. Tools & apps: Several links are important here. Mobile Apps: Click here to download eBay’s mobile app. Security Center: This link takes you to a page where concerns about fraud and safety are addressed. Site Map: A great way to find what you want on eBay is using this very handy road map of links. Downloads: Here’s where you can download some of eBay’s handy browser extensions. They add on to your browser to keep eBay notifications as part of your browser. They link to eBay-supplied selling-assistance software. Developers: So are you a geek too? If you are, you can enter eBay’s Developer program and get access to the eBay API for fun and profit. Gift Center: Send someone an eBay gift certificate or card for any special occasion. You can print it yourself, or eBay will send it to any address you provide. The gift certificate is good for any item on the site for the value you specify, and you can pay for it immediately with PayPal. If the person you give the gift certificate to bids higher than the value of the gift certificate, he or she can make up the difference by using another payment option. About eBay: Click this link to find out about eBay, the company, and to get its press releases, company overview, and stock information. You can also find out about eBay community activities and charities — and even apply for a job at eBay. Policies: This is a good place to visit to brush up on the site’s policies and guidelines. Government Relations: Here’s where your eBay membership can make a real difference. Join eBay’s Main Street Member Program and become involved with important legislation that may affect your online future. If you sign up, you’ll receive important updates. Community: Visit the Announcements Board (linked here) when you want to know about any late-breaking news. 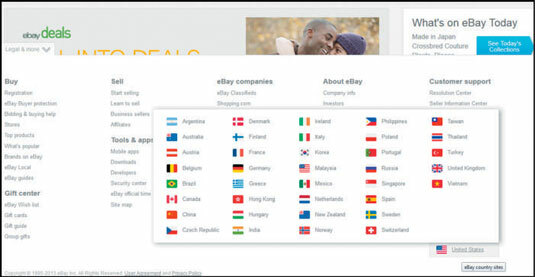 eBay Sites: Click United States, and a menu will appear with links to eBay’s international auction sites — 32 total, in addition to the U.S. Click one of these links and you jet off (virtually) to eBay sites in these countries. The international sites are in the countries’ native languages. It might be a good place to practice your third-year French — or maybe not! After you leave eBay USA, you’re subject to the contractual and privacy laws of the country you’re visiting.